Though Uber was late in entering India, IMO they are the main reason why cab industry is seeing such a big shift in India. The entire cab industry is undergoing a radical shift. Central and State Governments are introducing legislatures that is aimed at improving this industry. That’s it. 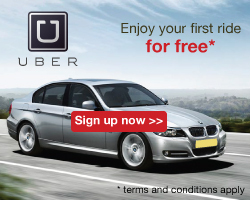 You are good to take your first free ride using Uber. You will get a credit upto Rs. 600 in your account. You shouldn’t be having an Uber account before. If you already have an account, then this isn’t applicable for you. You can’t link a credit card to Uber right now. PayTM is the only option of payment for Uber right now. You might be sceptical if this works. Believe me, it does. I have already taken multiple rides. Na, nothing illegal. It’s just that whenever a new user creates account with Uber, I get a free ride worth the same amount you are getting. So, yes, that’s one of the reasons why I am recommending Uber.